Theresa's Mixed Nuts: High-Fiber Breakfast Bread for Easy BTS Mornings! 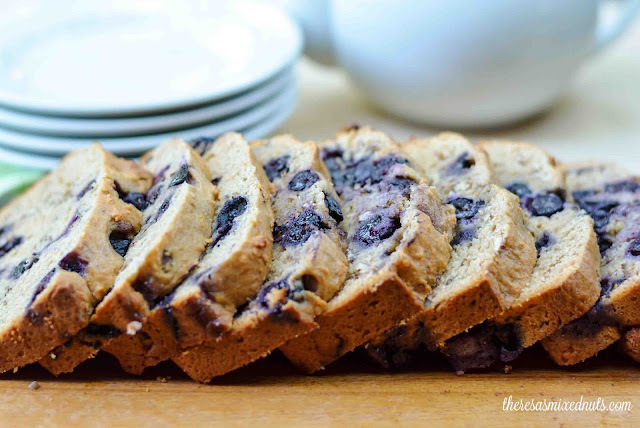 High-Fiber Breakfast Bread for Easy BTS Mornings! I've been in denial about how much time I have left with the girls for summer break, but now that bus and class schedules are arriving, coupled with the fact that I just dropped a small fortune on school clothes and supplies yesterday, reality is sinking in. We got spoiled on getting a few extra hours of sleep in the mornings and having more time for more elaborate breakfasts, it's going to be a small shock getting used to school routines again. It's back to cold cereal, bagels, and easy grab-and-go items, so I just added this High-Fiber Breakfast Bread to my make ahead morning recipe index so the girls can still feel like they are getting a good, home cooked breakfast without all the effort I usually put forth during the summer months. I love that it can be made in advance, is a great source of fiber, and will keep my girls feeling full until lunch. 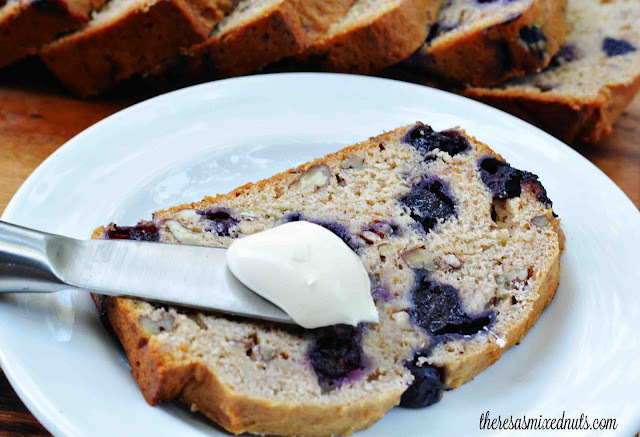 Plus, the juicy blueberries make it seem like an indulgent morning treat over other cold options. You could even pop the batter into some muffin tins for tasty morning muffins. Just be sure to lower heating times so they don't burn! Top with some cream cheese or whipped honey butter, this bread makes school mornings a little more bearable. What are your morning BTS breakfast staples? You know that anything that has half a cup of honey and banana in it gets my seal of approval! Looks nom! You could probably go without that one egg if you'd put a whole cup of yoghurt in it, that is how I do it, and baking soda instead of the powder is what I do too! You know we love our bananas and honey ;) I'll have to try it without the egg next time and see how I like it, though eggs are much cheaper than yogurt here. Will keep you regular indeed at ones feed haha good when food is good and it can fill you up. I'm always having to add fiber into things thanks to Isaak. ;) He's the one that has problems. But fiber is great, and so is this recipe! I'm the opposite and have to limit my fiber intake, thanks to my stupid illness. It's really good for the rest of the family though. This sounds like a really yummy breakfast bread. I love anything with blueberries. Me too! They are my favorite fruit! This breakfast bread looks phenomenal! 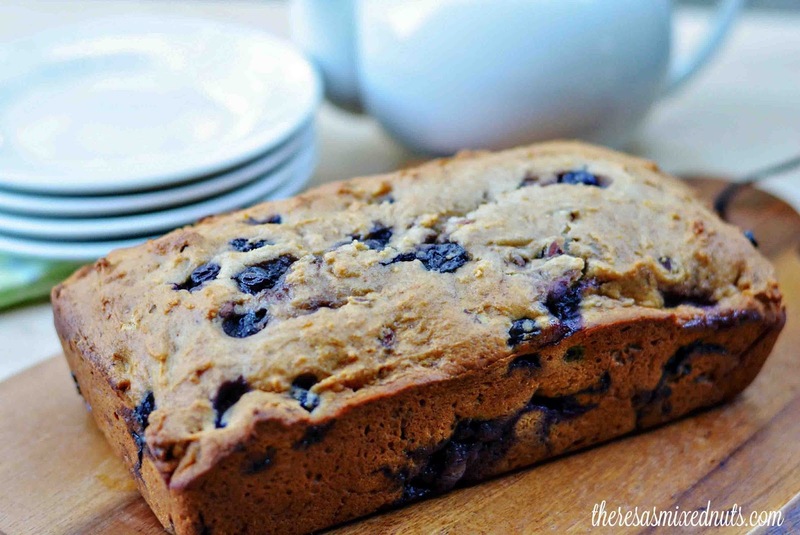 Blueberries are totally in season and we could always use more fiber. That bread looks delicious! I love quick and easy breakfast solutions! This looks delicious! And now I'm really wanting some of your bread for my bedtime snack! Yum! That bread looks amazing. I definitely need to add more fiber to my diet. Putting it in the muffin tins is my favorite way to go! Quick and easy and there's personal sizes for on the go. That looks divine. I'll be there in an hour. Smiles. I have a total love for sweet bread like this. I have got to bring this bread into my life this week! I am always looking for ways to add fiber to my diet. This looks like a delicious breakfast idea. I will have to make some to try out. This sounds like a delicious recipe. We try to sneak as much fiber into our diet as we can and this recipe sound perfect! Wow, I want to try this. I like homemade breads because I can cook the way I want it. I can definitely taste that honey and butter on my mouth! So tempting, Theresa .. These would definitely make for great muffins too! I like quick and easy when it comes to breakfast especially during the week when I'm dashing out the door!